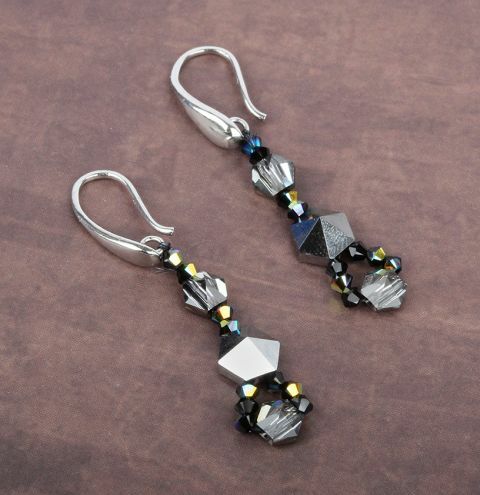 Learn how to make a pair of trending earrings with NEW Swarovski stud beads. Cut a length of thread and tie it to the loop of the earwire. Thread on two bicones a single hole hexagon bead, two bicones and go through one hole of a two-holed hexagon. Thread on three bicones, a single holed hegaxon, three bicones and pass through the second hole of the big hexagon. Weave your needle back through the beads to reinforce before tieing a few knots to secure and trim away your tail thread.